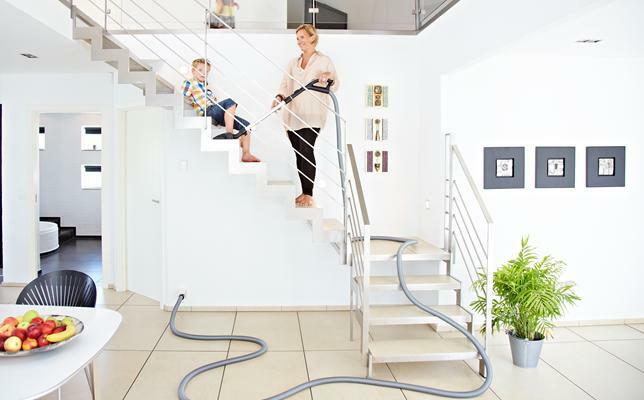 Stairs are no problem with your new vacuum cleaner. 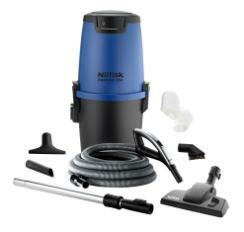 The result of using the Nilfisk central vacuum cleaner is easy vacuuming. No heavy and awkward machine to drag around, it is easy to get into corners, up and down stairs, vacuum at any height without heavy lifting. Having the Nilfisk central vacuum cleaner is like having an invisible vacuum cleaner, because you can hardly see or hear it. The quietness in particular is a major advantage, as you can still hear the phone ring, listen to music and watch TV. You can even vacuum clean without disturbing the rest of the family’s activities. Most people spend 4-6 hours vacuuming every month, so it makes good sense to consider the way we move, bend, and stand on our feet while doing it. The handles of a Nilfisk central vacuum cleaner have a soft rubber coating that feels pleasant in the hand. They are easy to use too, and the telescopic tube is easily adjusted to fit your height. The hose is lightweight and handy – and a great deal easier to deal with than pulling around the weight of a conventional vacuum cleaner.